OMG!!! Where have I been? Seriously. I am currently head over heels in love with The Vampire Diaries. I'm kind of cheating in this post because I haven't actually read the books but oh well. I know I am completely late, but for those of you who don't know, this TV series is about supernatural beings with a focus on...Vampires!! Oh you already knew that? Mmmkay. Well there are witches and werewolves, friendships, dead people, tested relationships, and Damon. Yes Damon get's his own category. There are two reasons why I love this TV series. 1) I'm always sitting on the edge of my seat and taken by surprise and 2) Damon. I can't help that I love sarcastic characters. Too bad that Damon is bad a lot of the time, but I can excuse killing people, crushing on your brother's girl, and manipulation if you are witty and sarcastic. But that's just me. Am I rambling?! Yes. But it's really hard not to. I just finished watching season 1 & 2 on Netflix and now I have to find a way to catch up on the season 3 episodes that I have missed. If anyone would have told me that I would love this series, I would have laughed in their face (but apologized afterwards). There are a few things that I generally do not like. I'm tired of love triangles which is always present here. And this teenage drinking scene is so unrealistic is is laughable. In my town you can't get in a bar unless you are 21 even if there is a pool table, but it seems to be the local hangout spot for these teens. And I could talk about all the freedom, but we're all used to it by now. I just ignore it all and pretend that the characters are the age that they act. Works for me. My gushing and rambling is getting out of hand so I'll stop here. Oh and are the books better, worse, or just different from the show? I need to know desperately. Which Book Movie or Book TV Series do you love? Feel free to create your own post and link up. Don't want to create an entire post? Tell me your favorites in the comments. Thanks for stopping by for another week of Why I Love Wednesdays!! Someone else mentioned The Secret Circle. I'm going to have to check it out. Thanks for sharing. Don't forget the linky allows you to upload your links for everyone to see. Can't wait to read your post. After reading the comments, I"ve pretty much decided to skip the books. You may have to rent the first couple of series. I watched them on netflix streaming. I'm finally catching up on Season 3. AAAhhhh!!! Then I have to wait with everyone else. I wish I could have stretched it out more. I so love this show. I'll look into The Secret Circle books. I'll likely skip The Vampire Diary books though. I don't think I need them. I love Harry Potter but I stopped watching True Blooding after the first couple of seasons. I've never seen it. I'm not really much of a TV person because I don't have time. I really have to stumble upon the goods ones like I did with The Vampire Diaries. Oh that's so good to know. I'll stick with the series and won't worry about reading the books. My TBR is so huge anyway. I've never seen the Gilmore Girls but I'm really loving The Vampire Diaries. It has quickly sprung to my favorite. I started watching season 1 and season 2 before I knew to record it on my DVR. So I'm catching up on season 3 through itunes. I've started Season 3 and it is awesome!!! I'm so loving it. There are many dimensions to the characters. It is just so well done in every way. 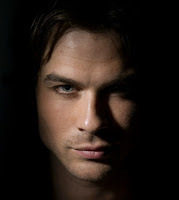 I love The Vampire Diaries and spend a lot of time drooling over Damon too! Lol. I got hooked on this show early on but did miss some episodes last year. It's been off here for a bit. I'm hoping it comes back after Christmas. Another good one that just came out this year is The Secret Circle. I don't watch a lot of tv but I'm hooked on these two and Survivor. Lol, I haven't actually read the books either, but I agree about the show. ;) Have heard it's actually better than the books, which is definitely unusual. I'm not even sure I want to read the books though, but I'm happy watching the series! I think it's a great pick! I've heard great things about this show, but I've never sat down to watch it! Perhaps I should remedy this. Regardless, here's the link to my post! I have been wanting to watch this series AND read the books. I have heard they are pretty good, but never read them. They whole series is at my library, so I may check a book out here and there. My all time favorite Book to Movie/Tv show would have to be Hitchhiker's Guide to the Galaxy. I loved them both! I LOVE this post! It's so much fun and your gushing has seriously totally improved my mood. :) I am always impressed with this show and all of the twists and turns it takes. I read the books ages ago when there were only the first four published. They're good, but more like "ok good" and they're totally different from the series. I think the tv show is a million times better than the books. BUT, The Secret Circle books are SO much better than the VD books and TSC tv series. I haven't read the books either, but I kind of feel like I don't have to because the show is so awesome! I've heard the best things about this series. I'm ad I never caught it from the beginning. Maybe I'll look this up on Hulu and try to catch up. I never watched the show at all (or read the books). I love vampire stories too. I haven't read or watched The Vampire Diaries, but I've heard great things about both. My favorite book to movie would have to be Harry Potter and my favorite book to TV show would have to be True Blood. I have yet to watch the Vampire Diaries. I would pick Sookie Stackhouse series for True Blood. I LIVE FOR THIS SHOW. It's absofreakinglutely awesome. And I love that there are so many dimensions to each character. Get thee to season 3 quick! I'm literally dying waiting for Jan for the new episodes. Welcome to the club! TVD is my guilty pleasure now and I never thought I'd like it so much. It's very different from the books. Only some characters and plotlines are the same, the rest is is the work of the writers. I've read most of the books and to me the tv show is much more interesting. I guess I just don't like LJSmith's writing. I really love The Vampire Diaries too! My fave TV show is Gilmore Girls. I know it's a bit old now and it's not actually based on a book but it's very bookish in its content. I just love it! I love Harry Potter, Twilight, The Chronicles of Narnia...I could go on and on. After this last season, I'm not sure I'm totally into Stefan anymore. My feelings have dramatically changed. Although, I've always rooted for Damon and Elena. But there was something sweet to Stefan and he was very charming...now I just see "The Ripper." Don't feel bad...I haven't read the book either. However, two are sitting on my bookshelf. lol I'm rambling too! Not crazy about Klaus...wish his angle would end and super fast. Some of the story lines are a little crazy and go off on weird tangents, but it's all good. Can't wait for it to start up again!!! I'm with you. Based on the comments, I'm probably going to skip the books. I'm so invested in the series though. I've been missing out. I enjoyed the movie but haven't read the book. I know I know. I should have. I think I'm probably going to skip the books. I'm not planning on reading the books now but I'm loving the series. You should try it. Give it a few episodes though. I know. I'm so silly. I stopped watching True Blood after the 2nd or 3rd season. If you give the Vampire Diaries 2 or 3 episodes you might like it.